The American cartoonist history is vast and grand. Inevitably this heritage inspires up and coming writers, illustrators and digital animators. At the same time, nowadays the boundaries between different artistic techniques are diffused: drawing, painting, digital art, graphic design, sculpture and so forth. All these platforms can be artistically embraced at once. Andy Rementer (USA) is one of my favorite examples to illustrate such a case. His creative mind combines drawing, cartooning, painting and animating. Now he has crossed the barrier of the 2D teaming up with artwork producer and publisher CASE STUDYO (Belgium). 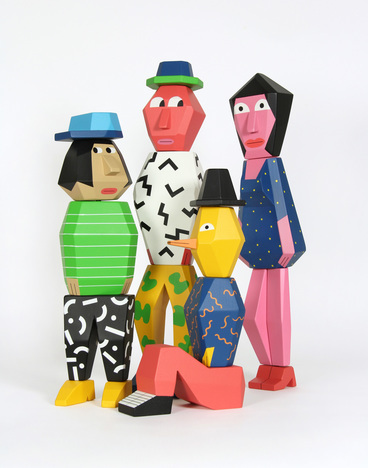 People Blocks is a limited edition artist sculpture series designed by Andy Rementer and produced by Case Studyo, which features four unique wooden characters entirely made and painted by hand. This splendid artistic collaboration is a win-win situation, where Rementer acquires both high-end result and understanding of his vision due to CASE STUDYO’s bold experience with contemporary artists, and CASE STUDYO gains all the spirit of Rementer’s work, high key color, bold decorative pattern and oddly pensive characters. 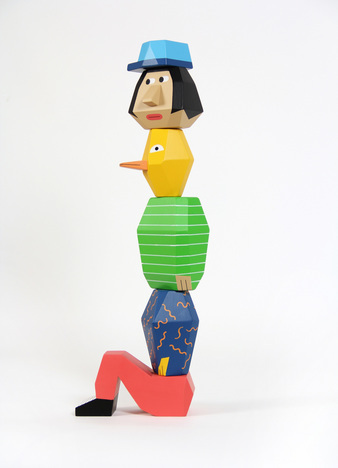 The individual pieces are interchangeable, allowing them to be re-assembled and stacked to create custom characters or abstract sculptures, which interact in unexpected and often humorous ways with the surroundings in which they are arranged. 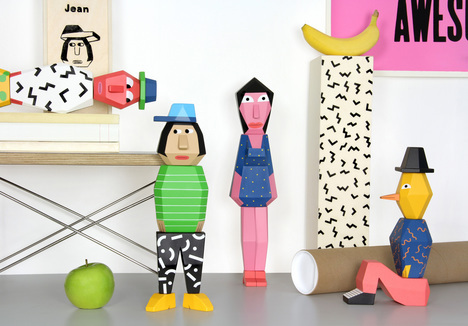 These characters soak a sense of design bind to pop art and Memphis Group era. 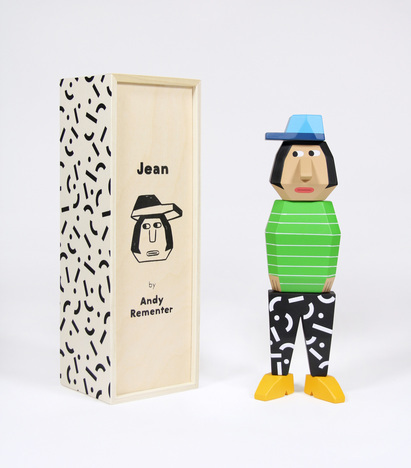 The characters: Antoine, Fabienne, Jean and François are sold individually and packaged in a screen-printed wooden box. Each sculpture comes with a certificate of authenticity signed and numbered by the artist. Available for purchase at Case Studyo and Project No. 8 in New York. This is the first time Andy Rementer works outside his normal framework – 3D modeling partner Margherita Urbani was the link between Rementer and Case Studyo – so we wanted to know a bit more about this lovely initiative. How the idea started in the first place, how you met Case Studyo, and how was working with them? 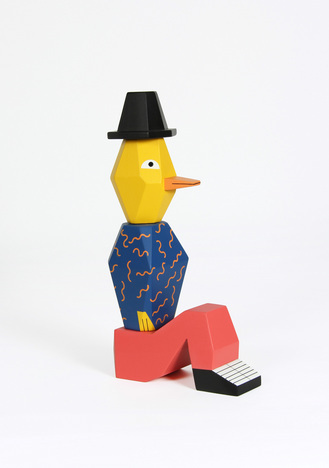 I’ve long been a fan of Case Studyo, especially their beautiful porcelain pieces by many great artists like Parra, Steven Powers and Todd James. We started talking about collaboration and eventually came up with the idea to use wood. I also traveled to their lovely studio in Gent and was a pleasure to see many of their lovely creations in person. A bit of the creative process and the experience for you to get done characters into actual pieces in 3D instead of your 2D. We wanted to go beyond a static object and instead add a functional element, so we landed on this stackable/interchangeable concept. It was a fun challenge for me to go from a flat drawing to something 3-dimensional. My creative partner Margherita Urbani translated my sketches into 3D renderings, which we used to communicate to Case Studyo for the production. All of the characters were made in Belgium with each piece being hand made and painted by skilled craftspeople. This project was a true collaboration in many ways, I’m very proud of it. They are available online at Case Studyo, and currently available in-store at Project No. 8 in NYC. Anything you estimate interesting to mention. Please keep an eye on the project, as the series will be growing soon. Specification: Characters measure between 30 and 40 cm in height.